I have a love of wild things and of old things. When the season’s right, I spend my time venturing on foot into the hills that surround our little mountain town. There, with a mindful and ethical approach, I gather wild foods in a basket slung over my arm at the elbow, and bring them home to eat. Spring brings dandelions and nettles, summer brings raspberries and the tiniest alpine strawberries while porcini, oyster mushrooms, and chanterelles erupt from the dank and wet earth of the forest floor. The first stop on our recent travels, was a a little grass-fed dairy in the heart of Devon where we nestled into a canvas-covered cabin and cooked farmhouse stews, hashes and omelets over a woodburning stove. We watched cows come into the pasture in the morning, mowing down the verdant grass with audible munching before settling down to rest beneath the yawning grey English sky. 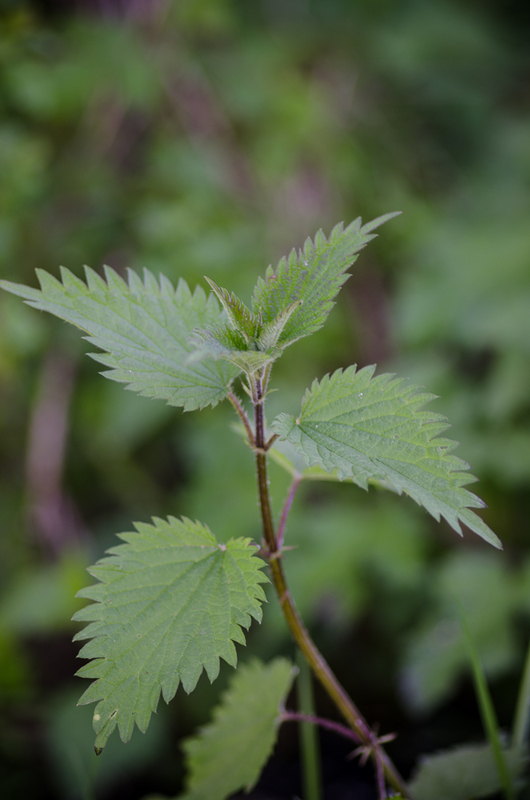 There, at our campsite, I enjoyed the privilege of gathering one of my favorite foods of spring – stinging nettle. Stinging nettle is a wild and unruly plant, and, like many wild foods, it is extraordinarily rich in nourishment. Particularly rich in beta carotene and other antioxidants as well as B vitamins, folate, potassium, iron, sulphur and vitamin C, stinging nettle puts spinach and kale to shame. There’s some evidence that stinging nettle can help alleviate seasonal allergies and hayfever, as it acts as a natural antihistamine (source), as well as help to reduce blood pressure and alleviate prostate problems in men. Stinging nettle contains formic acid, an evolutionary measure that helps to insure its survival by deterring predation. Fresh nettle will sting any skin it comes into contact with causing itchy, burning welts that disappear relatively quickly and that do not typically cause permanent damage; however, you must take extra caution when working with nettle. I wear long sleeves, long pants, boots and gloves when gathering and cooking with fresh nettle. Once cooked, nettle loses its sting and can be handled and eaten without issue. Nettles grow wild in the spring and early summer across North America, Europe and some parts of Asia. Not only do I pick stinging nettle when it is available fresh, but I also receive it in messy bundles from our local CSA – a special CSA that not only provides excellent heirloom vegetables and fruits, but also emphasizes culinary and healing herbs as well as wild foods. When the season grows too hot or too cold, I purchase organic dried nettle leaf online for use in herbal tisanes and infusions like this nettle and red clover infusion that’s always a favorite of mine. With a flavor similar to spinach, stinging nettle pairs well with cream and eggs and in other foods as a substitute for spinach, and makes an excellent omelet paired with chives and sharp cheddar cheese (get the recipe below). I like to use the fresh nettle in cream-based soups similar to this recipe for Lovage Soup or in fresh herbal infusions like this one. Dried nettle (available here) is excellent in teas, infusions and tisanes, and makes an excellent tonic for year-round use. After spending the morning gathering nettles, and with little else at my disposal but the products of the dairy – butter, eggs, cream, cheese and milk – I prepared this recipe for a simple omelet packed with stinging nettles and sprinkled with fresh chives. We served it with fresh berries and cream. Stinging nettle, like other leafy greens, pairs well with full-fat dairy as the fats in the dairy products (rich in fat-soluble vitamins and minerals themselves) help your body to better absorb the antioxidants contained within the nettle leaf. Filled with stinging nettle, chives and cheese, this 6-egg omelet makes a an excellent breakfast served with fresh fruit and cream, or a simple lunch when paired with a salad and crusty slice of no-knead sourdough bread. If you cannot find stinging nettles, substitute spinach. Drop the nettle leaves into a medium sized stockpot, sprinkle with salt and pour in 1 to 2 tablespoons water. Set the pot over medium-low heat on your stove, and cover it with a tight-fitting lid. Allow the nettles to wilt until they release their juice, soften and grow limp - about 20 minutes. Remove the nettle leaves with a slotted spoon and transfer them to a fine-mesh sieve (like this one), press them firmly with the back of a wooden spoon so their juice runs out, then set them aside while you prepare the omelet. Beat the eggs with heavy cream until loosely combined, and not frothy. Warm the clarified butter in a large and well-seasoned cast-iron skillet (like this one) over medium-high heat. When it melts, pour in the eggs, swirl the pan to promote an even layer of egg and let them cook in the hot butter until the edges begin to ruffle ever so slightly - about 5 to 10 seconds. Reduce the heat to low, and cover the skillet with a lid for 20 to 30 seconds or until the eggs set. 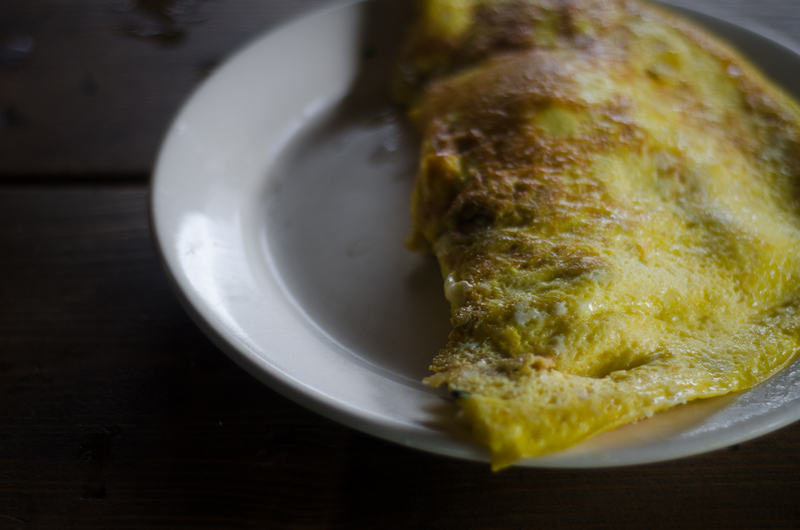 Lift off the cover, and fill one side of the omelet with the wilted nettles, sprinkle with chives and top with slices of cheddar cheese. Fold the unfilled half of the omelet over the filling, return the lid and let it sit a further 20 to 30 seconds, then serve. I often prepare large 6-egg omelets like this one, then slice them and serve them for breakfast; however, you may also prepare two 3-egg omelets instead by simply working in batches. And let’s not forget nettle risotto, a delicious traditional dish from North-Eastern Italy! I love the idea of this omelette. It looks fantastic! I have an issue unrelated to nettles. It’s a 14-year-old son obsessed with football. Aside from sport culture and injury concerns, I’m trying to figure out how to replace the pervasive tradition of a white pasta and gatorade football diet with something more nutritionally redeeming. Help! Jenny, if you salt the nettles after adding them to the omlette, you can save the nettle water and use it as an exttraordinary hair tonic/conditioner. Nettle water does incredible things for the hair!!! Brooke, I feel for you honey! I would not put gatorade in my gob for cash money! You are up against some serious competition for “expert” acknowledgement on the gridiron, though. My 24 year old son sent me this priceless link, given to him by his girlfriend. Once I stopped laughing, I sent gratitutde to the heavens for blessing my boy with a significant other with attitude (and intelligence) now that he is no longer reliant on his mama. See if http://thugkitchen.com/ can be of any help to you, and I wish you the best of luck. Lucky enough to get nettles every year in my CSA box – love them and use them anywhere I would use spinach. Intrigued by nettles, have just found some by the river and currently wilting them down in a pan. Just wondered, does the squeezing out and discarding the juices not loose the nutritional content? That’s more for culinary purpose than for nutritive; that is, if you don’t squeeze out the excess liquid, the omelet filling can become super watery. Ps, for those that can’t get raw cream or don’t like pastrised cream. I made it with just eggs, nettles, some (nitrate free) bacon, all cooked in olive oil with some flat leaf parsley and it was very nice. 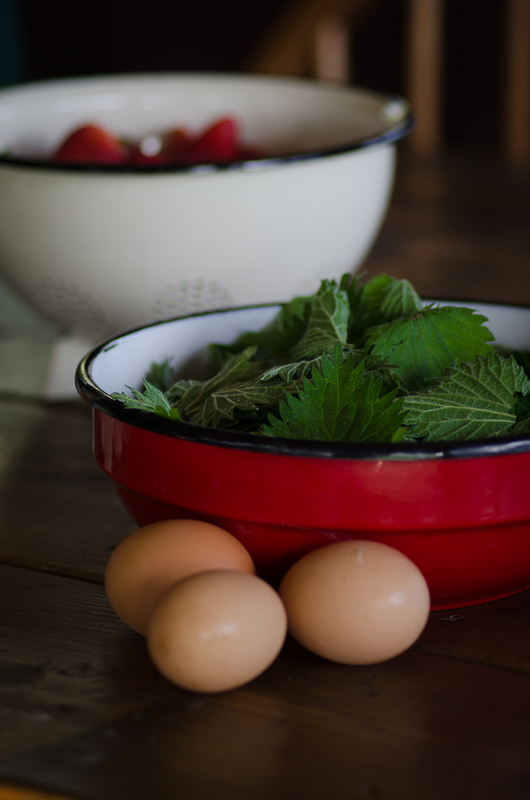 Nettles are one of my favorite wild edibles – totally packed with vitamins and minerals! I’ll definitely try them in an omelette next time I gather some. Thanks for sharing. I love nettle tea in the spring. I haven’t done much cooking with it, except for a nice nettle soup from Jessica Prentice’s Full Moon Feast. YUM! THanks for this delicious recipe. It is still offered at my farmer’s market now in late summer, though it seems to be seeding. When I have brewed it this late, it is just not the same. Do you know if there is a difference nutritionally regarding when harvested or if there is a time it should not be? Yes there is a big difference in the formic acid content when it flowers and even more when it goes to seed. It is too high and is not healthy for internal consumption. I love eating nettles! They are superior to spinach, IMHO. They’ve got an almost cinnamon finish that I love. I also use them to cure mosquito bites! I have a mild reaction to nettles. They stings and burn a little for less than ten mins. I apply the nettle leaf to the mosquito bite and it stops itching completely. The only odd side effect is when the mosquito bite would itch later in the the day I get a tingly warm feeling where I applied the nettle to it. It never itches again! wow! I love nettle and I will be trying this !check the awesome recipes at whimsytummy.blogspot.in I just loved them and I think you will too! My favorite nettle use (because I’ve never had it fresh) is to make a strong infusion of the dried leaves, steeped overnight to cooling, and then warm it back up, just until steam wafts from the surface, and pour it over a blob of raw white miso. The sweetness and saltiness of the miso go particularly well with the thick umami-ness of the nettle infusion. I suppose a knob of softened grass-fed butter would be a great addition to help absorb all the delicious nutrients. I love stinging nettle. I’ve only first tried it fresh this year since I could find it a local small farm that sells tons of fresh in season produce. I think more people in the States would eat it if they understood how tasty it is! It’s sort of like a light melon flavor crossed with cucumber that is so ultra refreshing. I buy it dried as well from our organic bulk food section at the grocery store since it adds so much iron to meals. I add it where I don’t have meat as it pairs wonderfully with any veggie. And honestly, the dried kind almost no one can taste any difference. So it’s great to add nutrition for any picky eater! The stinging nettles in my garden have grown so much after recent rains; your omelette sounds wonderful. I usually make risotto or soup; good to have something different to cook with them. Wow! All this time I thought the entire field of nettles growing at my house were just pesky unwanted plants! I guess I need to try some of these recipes! When cooking eggs in cast iron, especially if using an electric stove, I find it easier on the eggs if you turn off the burner before adding the eggs to the pan. The residual heat is more than sufficient to cook the eggs through. This goes for grilled cheese sandwiches, too. Just picked a big bunch of Nettles yesterday and shared with my neighbor she was thrilled! I love these amazing greens!